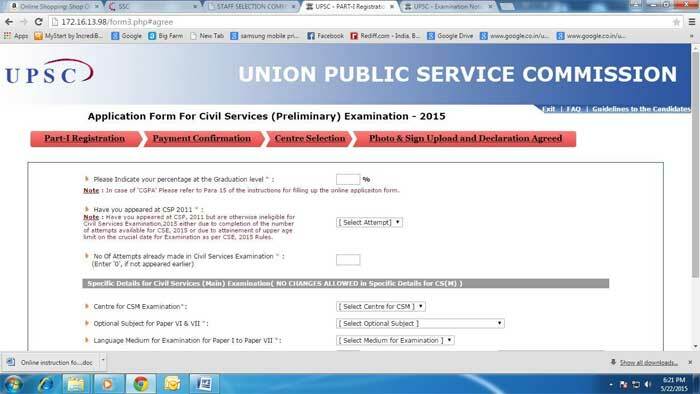 (Info) How To Fill UPSC IAS Exam Form Online | IAS EXAM PORTAL - India's Largest Community for UPSC Exam Aspirants. 1. Applicants are advised to carefully go through the detailed Notice of Civil Services Examination, which can be viewed on the website of the Commission (www.upsc.gov.in) in Examination submenu. 2. 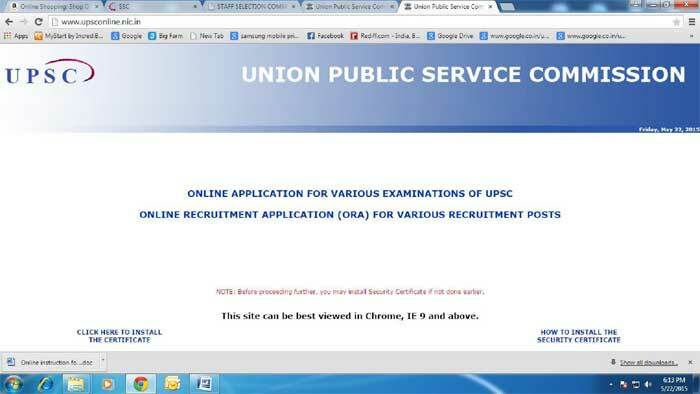 To apply for CS (P), applicant should click on the link available on the website of the Commission (www.upsc.gov.in) (UPSC ONLINE APPLICATIONS). This will take the candidate to the http://www.upsconline.nic.in/. OR The applicant can directly visit http://www.upsconline.nic.in/ website to fill up the application. Screen as given will appear. 4. Click on the Part 1 registration given against Notice No. 09/2015-CSP. This will lead you to the Part 1 Registration Form. 5. The Part-I Registration is done in 2 steps in which the applicants have to fill in the requisite information, particulars and details asked for. 6. Applicant must fill in all the required fields. Fields marked with red STAR (*) are mandatory and essential to be filled in by the applicant. Name: As recorded in the Matriculation/Secondary Examination Certificate. Applicants are not to use any prefix such as Mr. or Ms. etc unless their name consists of only 3 letters, as 4 letters are mandatory for NAME field. Gender: To select from Male/Female. Father’s Name: Applicant should not use any prefix such as Shri or Dr. etc. Mother’s Name: Applicant should not use any prefix such as Shri or Dr. etc. Nationality: Should opt from Indian/Others. Applicant should note that only Indian citizens are eligible for Indian Administrative Service/Indian Police Service. Marital Status: Applicant should choose from Unmarried /Married /Widow/ Widower/ Divorcee. Physically Challenged: Applicant should indicate by ‘Yes/ No’. PH Category: There are three categories i.e Ortho, Blind/Low Vision, and Deaf-Mute. Applicants with less than 40% disability will be considered as NON-PH and they are not eligible for claiming age relaxation under the Rules. For other details, applicant may refer to the Detailed Notice of this Examination. Physically challenged certificate date: Date of issue of the Certificate is mandatory. Community: Applicant should fill the appropriate category from General/ OBC/ SC/ ST. Applicants who belongs to OBCs but come under the 'Creamy Layer’ is not entitled to OBC reservation as per Rules. Such type of applicants will be treated as belonging to General category. If you belong to Minority: In case of yes, should choose appropriate ‘Minority’ option. Fee Remission Claimed: Admissible only to SC/ST, PH and Female candidates. Educational Qualification: Applicant should fill the appropriate information. Address: Applicant should fill the correct address for communication, including his/ her mobile number and e-mail address. 8. Here the system asks if the candidate wishes to apply for ‘Age Relaxation’. The candidate will be given the option to select the category under which he/she is applying for age relaxation. (Candidates are advised to refer to the detailed Notice which is available in the website www.upsconline.nic.in). 9. After filling Claiming Age Relaxation, applicant must click on “Continue” button at bottom of the page to proceed to the next step. 10. Percentage at Graduate level: This must be filled correctly. In case of 'CGPA' please fill as per the Rules of concerned Board/ University/ Institution. 11. No. of Attempts already made in Civil Services Examination: Must be filled correctly. Note: Applicants must fill these fields carefully as no request for change in these fields at a later stage (i.e. DAF ) will be considered. 13.1 Centre for Examination (Main): To be selected from the given list of 23 centers in dropdown menu. 13.2 Optional Subject for Paper VI & VII: To be selected from the given list in dropdown menu. 13.3 Language Medium for Examination for Paper I to Paper VII: To be selected from the dropdown menu carefully. 13.4 Information regarding hailing from Arunachal Pradesh/ Manipur /Meghalaya /Mizoram /Nagaland /Sikkim and claiming exemption from appearing in INDIAN LANGUAGE FOR PAPER A should be selected either Yes or No. 13.5. Applicants selecting ‘No’ in para 12.4 have to select the Language for Paper A. 14. Click on “Continue” button at bottom of the page to proceed to the next step. Here the system displays all the information provided by the candidate in the application form for verification. ‘Update’ button is also provided therein at the bottom of the Online Application details to move back and make any correction in the information filled in. The candidates are advised to check the filled in details and satisfy themselves that all information are correctly filled. No change/ edit request of any information filled by the applicants on the submitted application would be allowed at any subsequent stage of the examination process. However, application may be submitted by the applicant to correct its earlier mistake with requisite fee in case not a fee exempted candidate. 15. When an applicant clicks on I Agree button, his/her eligibility for age relaxation and other criteria is automatically checked by the system. With the correct eligibility, the system Displays the system generated unique ‘Registration ID’ along with the essential identification information about the candidate viz. ‘Name’, ‘Father’s Name’, ‘Mother’s name’, ‘DOB’, ‘Address’, ‘Examination Centre’ etc. opted by the candidate. 16. The applicant is also intimated that he has completed PART-I of the Registration of Online Application procedure. The applicants may however note that Application would be treated as incomplete and rejected unless accompanied with Part-II Registration. 17. APPLICANTS ARE ADVISED TO TAKE A PRINT OF THIS PAGE BY CLICKING ON THE “Print” OPTION AVAILABLE BELOW NOTE-2 THEREIN. THEY WILL BE REQUIRED TO INPUT THEIR REGISTRATION ID and DOB at subsequent stages. 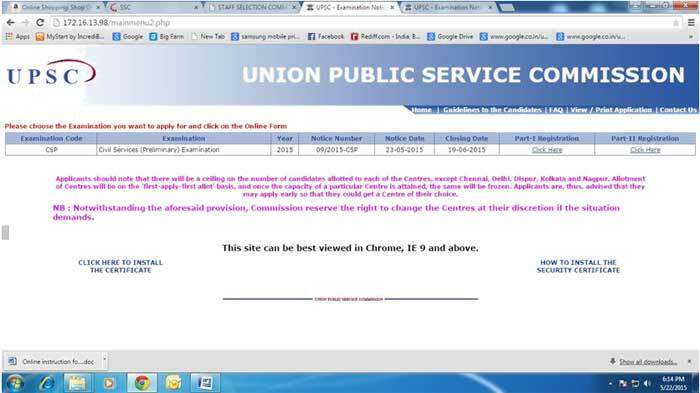 EXAMINATION CENTRE for Civil Services (Prelims) HAS TO BE CHOSEN FROM THE AVAILABLE DROP DOWN MENU. THEY CAN PAY CASH AT ANY BRANCH OF STATE BANK OF INDIA THROUGH THE PAY-IN-SLIP GENERATED BY THE ONLINE APPLICATION PROCESS. THEY CAN PAY ONLINE USING ANY VISA/MASTER DEBIT OR CREDIT CARD ISSUED BY ANY BANK/INSTITUTION. THEY CAN PAY ONLINE USING THE INTERNET BANKING FACILITY OF THE STATE BANK OF INDIA/STATE BANK OF BIKANER & JAIPUR/STATE BANK OF HYDERABAD/STATE BANK OF MYSORE/STATE BANK OF PATIALA/ STATE BANK OF TRAVANCORE IF THEY ARE CUSTOMERS OF THESE BANKS AND HAVING THEIR INTERNET BANKING FACILITY. Journal Number. 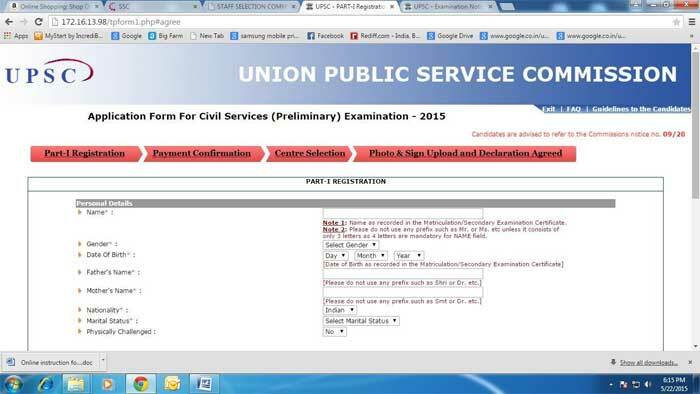 After paying fee through Cash Mode, The candidate would have to go to the website ( www.upsconline.nic.in) again and fill the transaction id and other details with PART-II Registration process. 21. After filling fee details (in case of cash payment) or paying fee through other than Cash mode, the application must click on the Continue button provided at the bottom of the page. 22. 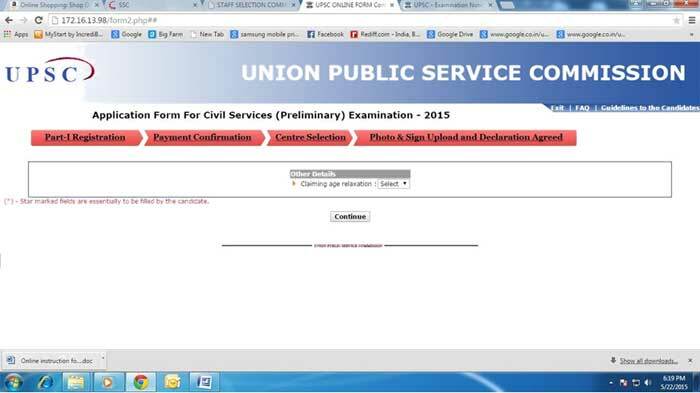 In next step, Applicant must fill in the Centre of Examination for Civil Services (Prelims) and click on the submit button given at the bottom of the page. 23. Photo and Signature Upload: Applicants have to upload images of their photograph and signature # in .jpg format, each of which should not exceed 40 KB in size and must not be less than 3 KB in size for the photograph and 1 KB in size for the signature. Each of the images of the photograph/signature should not exceed 40 KB in size (for photograph, the pixel size is 140 pixels height x 110 pixels width and for signature it should be 110 pixels height x 140 pixels width) and also to be ensured that the uploaded photograph/signature are proper and clear. 24. After uploading a fresh page shows the preview of the uploaded images by the candidate. Here the candidate is advised to see his/her uploaded photograph that the photograph is clearly visible/identifiable in the upper row and the specimen signature in the lower row. In no case these rows should be swapped and uploaded photograph and specimen signature must be clearly identifiable / visible, otherwise the candidature of the candidate is liable to be cancelled by the commission and no representation from the candidate will be entertained by the commission regarding any change for the wrong data uploaded /filled up by the candidate. If the candidate is satisfied with the uploaded images he may CONFIRM the uploading of photograph and signature by clicking on Confirm Upload button. If by any reason uploaded images are not up to the mark then the candidate can RELOAD these images by clicking on the Reload Photograph and/or Reload Signature button. They can view reloaded Photograph/signature by clicking on “Image refresh” button. The software will not save photograph and signature of the candidate unless he confirms the upload by clicking on Confirm Upload button. 26. In a next step, through a fresh page the applicant is intimated that their application has been submitted successfully. This page has also a link to view the complete application. Applicants are advised to take printout of their completed application right after they have completed the application process. 27. To view the application submitted by the candidate a link View/Print Application is also given on the home page. 28. Candidates applying online need NOT send hard copy of the Online Application filled by them online or any other document/certificate/testimonial to the Union Public Service Commission. However they are advised to take printout of the Online Application and retain it for further communication with the Commission. 29. The Candidates applying for the examination should ensure that they fulfill all eligibility conditions for admission to examination. Their admission at all the stages of the examination will be purely provisional subject to satisfying the prescribed eligibility conditions. 30. Mere issue of admission certificate to the candidate will not imply that his candidature has been finally cleared by the Commission. The Commission takes up verification of eligibility conditions with reference to original documents at subsequent stages of examination process.